While Jeff is off visiting his family in Southern California, I've been trying to finish sewing projects. 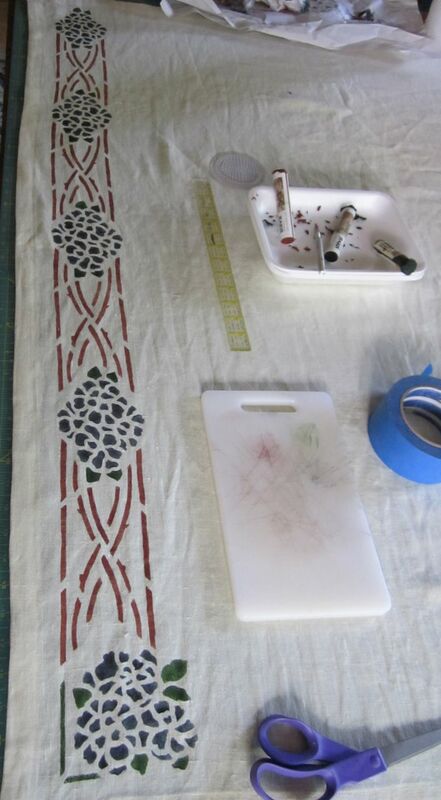 I spent the first day sewing the binding on my historic quilt. I machine sewed the binding on the front side, and I've been slowly hand sewing the back edge while watching TV. 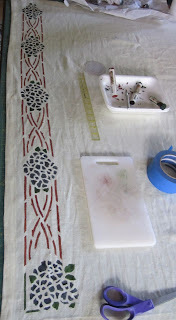 Today, I started stencilling the dining room curtains. I just finished one edge before taking a break. And then I realized I had goofed up the outside border color. I painted it with the rust color when I had intended to paint it with green. Oh well. And I'm also a bit disappointed there is so little difference between the blue and green colors. I'm not entirely sure whether I want to wait and let this dry and try and paint over it with green, or wether I just go with the mistake and paint it all in the rust color. Unfortunately, it takes days for this oil paint to dry and I wouldn't be able to see if the green would cover for probably a week. I may just have to go with it. From the picture, the colors look nice -- even if it wasn't what you designed. maybe they are just woody stems rather than vegetative ones?